The Tennessee Valley Authority is a federally-owned corporation that was created in 1933 as a project to control the devastating seasonal floods of the Tennessee River and its tributaries, to generate hydroelectric power to meet the underdeveloped region's energy needs, and to open up the portions of the river above the rapids at Muscle Shoals, Alabama, and Chattanooga, Tennessee, to navigation. The TVA operates a sprawling network of locks and dams and is the principal electric power provider to most of Tennessee, large portions of Kentucky, Mississippi, and Alabama, and smaller areas of Georgia and North Carolina (not just hydroelectric anymore, but also coal and nuclear generated power). Its other responsibilities include the maintenance of a nine-foot deep channel on the Tennessee River from Paducah, Kentucky, to Knoxville, Tennessee. The lakes created by its dams have become a major source of tourist revenue for the region. 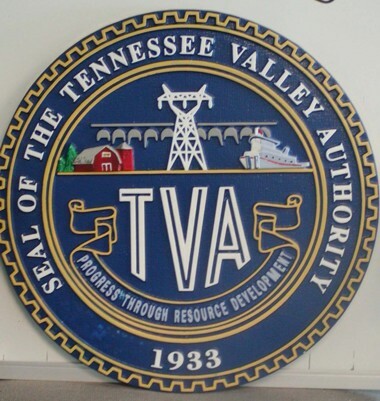 The TVA's flag, consisting of its logo in black on a white rectangular background, all on a blue field, can be seen at its headquarters and some of its major facilities. 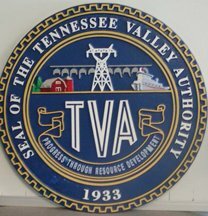 The TVA is an independent executive branch agency. The current Flag was designed by Whitney Smith of the Flag Research Center.